I'm sure I've mentioned to all my avid fans that I play the "London System". No? Oh, well, I do, simply because it requires little maintenance, absolves me having to play 1.e4 and deal with the Sicilian fanatics and enables me to reach the middlegame relatively intact, if rarely with the advantage that is supposed to be expected with playing White. Although often touted as a 'boring opening', leading to many draws, like any opening, it has enough in it to gain quick wins, often with the 'Greek gift' type of attack. However, I think the below is an unusual type of mate to be revealed by this particular opening , to say the least. 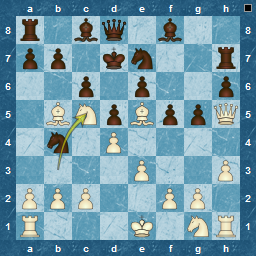 I admit, gained with a lot of ( I assume unwitting ) help from Black, and I doubt I would ever see this outside of blitz. 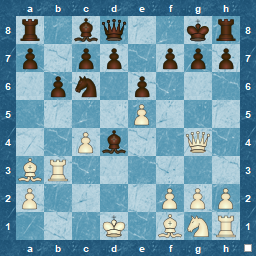 Really, this was "trickery" against someone who must be completely naive in chess, to allow the manuoevre Nd2-b3-c5 plus Bb5, when his king was sitting at d2. I certainly don't feel guilty : sometimes satisfaction is its own entertainment.